In recent years we have discovered that underground organs of turf grasses are commonly attacked by ectotrophic fungi that cause destructive patch diseases. Ectotrophic fungi grow over living turf grass roots and underground stems as runner hyphae (dark fungal threads). There are several ectotrophic fungi that cause turf grass diseases and their appearance is similar on the different turf grass hosts they attack. For convenience, all of these fungi are referred to as ETRIF (ectotrophic root infecting fungi) to simplify their diagnosis and associations with the similar turf diseases they cause. 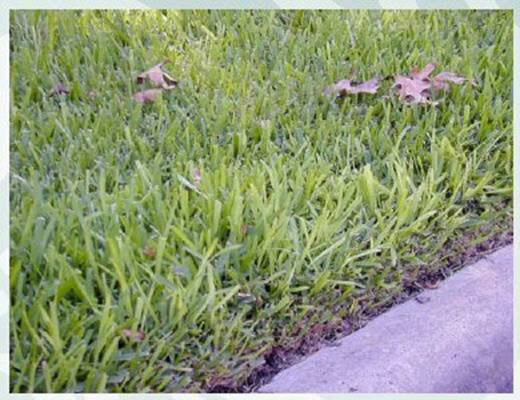 Take-all root rot (TARR) of St Augustine grass has emerged as a major problem on landscapes in Texas as well as other states along the Gulf Coast including Florida. The disease is caused by Gaeumannomyces graminis var. graminis, which belongs to the ETRIF pathogen group. The brown-black mycelial growth of the fungus (Fig.1) colonizes roots, stolons and shoots but it is primarily a root destroying pathogen. Damaging effects of this disease on St. Augustine grass were first observed and described in Texas by Dr. Joseph Krausz (plant pathologist at Texas A&M University) and in Florida by Dr. Monica Elliott (University of Florida). 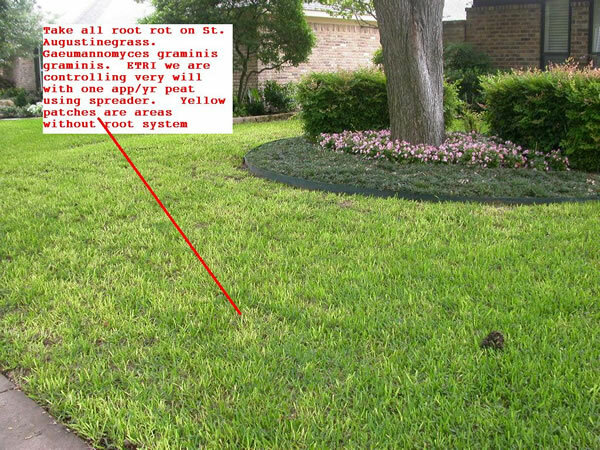 In a 1999 survey of St. Augustine grass lawns in north Dallas, we observed yellow patch symptoms (Fig. 3) of the disease on 61% of 70 lawns during the month of September. If this disease progresses it kills the stolons and produces patches of dead grass during summer ranging from 3-10 ft in diameter. Because of the widespread nature of this disease, our research investigations sought to develop a practical control measure for landscapes with St. Augustine grass lawns. 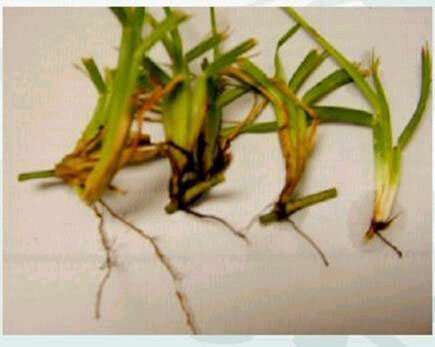 Symptoms of take-all root rot disease (TARR) typically appear on St Augustine grass as diseased patches of turf during late spring and throughout the summer months. Pathogen activity causes a severe root rot that completely destroys tap roots which anchor St. Augustine grass stolons to the ground. Visual symptoms of the disease on lawns are initially small yellow patches of turf with leaf blades that appear chlorotic while the healthy leaves remain a typical green color (Fig. 3). The yellow patches are thought to be associated with the production of a toxin by the ETRIF fungus when the turf is growing under stressful conditions. Yellows symptoms of the disease can persist on lawns throughout the summer growing season. Dark brown or black mycelial threads of this fungus (Fig. 1) are distinctive and produce scattered black dots (hyphopodia) that anchor the fungus to the plant. Roots of affected plants become shortened, discolored, and often have dark colored lesions that are visible upon inspection with a hand lens. Eventually the roots become completely rotted and shriveled to form a non-functional root system (Fig 2). In the final stages of decline, diseased stolons gradually succumb to hot summer temperatures or cold winter weather and produce large patches of dead grass that do not recover from injury. Affected patches of turf can at first be quite small ranging from 1-2 feet in diameter; however, they also appear as larger areas that can range from 5-10 feet in diameter. Diseased areas are not always circular but often appear as roughly circular patterns in the lawn. 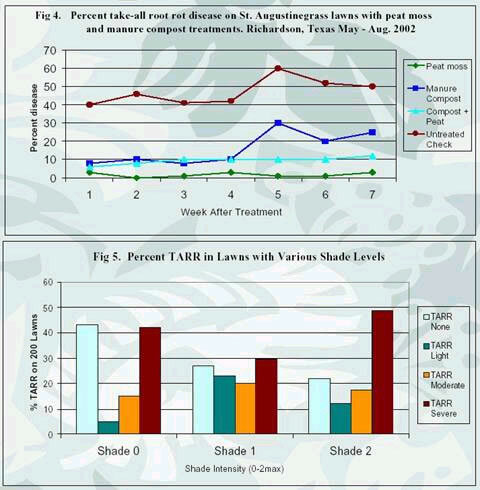 In our 2002 TARR survey on North Dallas lawns, we observed a higher number of take-all symptoms in heavily shaded areas compared to areas receiving direct sunlight or partial shade for most of the day (Fig. 5). TARR disease should not be confused with white grub damage which can also appear at the same time of the year. The best clue is to look for the yellow or chlorotic leaf extensions (fig. 3) on St. Augustine grass turf that has not received mowing for several days. Symptoms of TARR disease also include the appearance of brown shriveled roots that are killed by the fungus as opposed to white grub damage where the roots are actually removed by insect feeding. 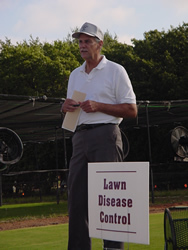 We used two approaches to control the TARR disease in field investigations on area lawns during the past three years. One approach utilized conventional fungicide sprays with Terraguard ®, Bayleton®, Heritage®, and Banner Maxx® using 2.9L of spray per 10 m2. A second approach utilized topdressing lawn care products including (1) manure compost and (2) sphagnum peat moss. Manure products can enrich the microbial number and diversity for variable lengths of time and low pH products like peat moss had been shown to suppress the Gaeumannomyces fungus in previous research. While some of the manure based topdressing regimens demonstrated improved turf grass growth, effects on disease control were only partial and limited in duration. Research field plots with the fungicides Terraguard ® (4 - 8 oz) or Bayleton® (2 oz) treatments gave good results for controlling the take-all root rot symptoms. Success with fungicide treatments was better on a lawns maintained under shaded conditions compared to lawns in full sunlight. A second approach with topdressings used low pH topdressing with sphagnum peat moss. This topdressing approach has consistently demonstrated TARR disease suppression in field studies during the past two years. Our field comparisons of manure compost vs. peat moss topdressings indicate the peat moss to be a more effective long-term approach for reducing symptoms of the TARR disease. Some of the older research literature on the fungus causing TAP indicates its aversion to low pH. This might explain how the peat moss (pH = 4.4) controls the fungus on exposed stolons and roots where the disease is active. There is no indication of varietal resistance to take-all root rot since the disease has been noted on all of the commercial St. Augustine grass varieties. The use of fungicide applications is also limited with only a few fungicides that are approved for use on this disease. Although there is good evidence that fungicides are capable of controlling the disease, environmental conditions and vigor of the turf may pose some limitations on the effectiveness of fungicide treatments. At this time we have no explanation as to why we observed a lack of uniformity in fungicide effectiveness on different lawns. The use of organic topdressing to control turf grass disease is a relatively new approach to controlling turf grass diseases. Because of the complexity of microbial antagonism, fertility values of topdressing materials, different types of diseases and susceptibility of pathogens to pH, most of this type of research is directed by trial and error experimentation. We do have good evidence that the acid peat moss topdressings result in control of TARR on St. Augustine grass on Dallas area home lawns. In comparison studies, peat moss topdressing reduced symptoms of TARR for longer periods than cow manure compost and is thus considered the more effective disease control product. Additional research will address the best time to apply peat moss topdressing products as well as possible effects on other turf grass pathogens and diseases.